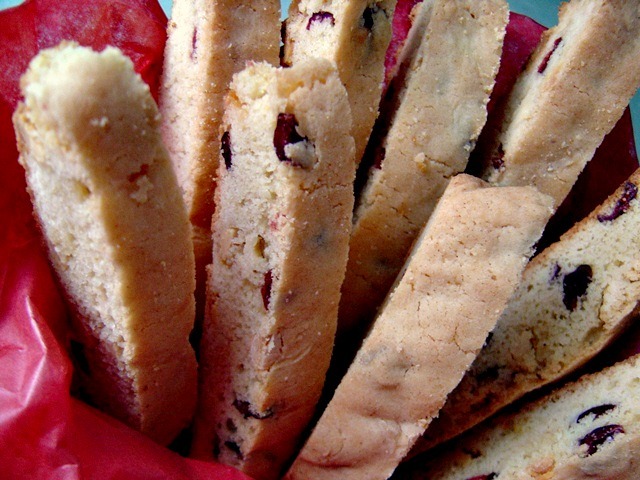 Orange cranberry white chocolate biscotti: A crunchy and sweet cookie of tart cranberries, zippy orange flavor, and chunks of white chocolate. Perfect for coffee dunking! Continuing with my promise to post about different types of Christmas treats, the final days before the big day brings Orange Cranberry White Chocolate Biscotti. After making Dorie Greenspan’s fabulous triple chocolate biscotti a couple of weeks ago, I knew I needed to find a second type of biscotti to include in my Christmas goodie packages and for my Christmas Eve cookie platter. I scoured through my cookbooks, checked online, and was finally pointed in the right direction by Bridget when she suggested the recipe Deb’s got posted over at Smitten Kitchen (from Bon Appetit). Of course! As a daily reader of SK, I should have known that Deb’s got a delicious recipe over there. Sometimes you just need a little prompting though, right? As most biscotti recipes do, this one also called for nuts (almonds) which I subbed for white chocolate. And because I really didn’t feel like running out in the snow on Friday to buy orange liqueur, I used pure orange extract in place of the liqueur and the orange zest. Who doesn’t love the orange-cranberry combination?! See also: cranberry bliss bars and orange cranberry chocolate chunk bundt cake! All in all, these biscotti were just outstanding. I mean, seriously outstanding! Better than the triple chocolate biscotti I made recently, if that’s possible. I’m still tempted to dip them in some chocolate but I couldn’t really decide which – white? dark? milk? I think they all would work perfectly! But at this point, I’m not sure if I want to take anything away from the flavor of these sweet and savory treats. If you’re still at a loss for your cookie platter or goodie packages, you MUST try these orange cranberry white chocolate biscotti!!! These biscotti will keep well stored in an airtight container for up to 1 week. Position rack in center of oven and preheat to 350° F. Line baking sheet with parchment paper. Sift flour, baking powder and salt into medium bowl; set aside. Mix sugar, melted butter, eggs, vanilla extract, orange extract in large bowl. Add flour mixture to egg mixture and stir with wooden spoon until well blended. Mix in white chips and cranberries. Divide dough in half. Using floured hands, shape each dough half into 13 ½-inch long, 2 ½-inch wide log. Transfer both logs to prepared baking sheet, spacing apart. Transfer logs to work surface; discard parchment paper. Using serrated knife, cut logs on diagonal into ½-inch wide slices. Arrange slices standing up on same baking sheet. Bake 12 minutes. Transfer to rack and cool. Biscotti can be made 1 week ahead and kept stored in airtight container at room temperature. These look fabulous! I love biscotti for the fact they last a while and make a perfect dunker for coffee! Biscotti are great to make this time of year…I made a gingerbread version a few days ago to take home to my family. It is easy and delicious…and they last forever! biscotti are oh so trendy this year! Sarah, I saw your reference to a gingerbread biscotti. This is my favorite, could you post or forward your recipe to me? I made these last night to give to co-workers in their Christmas goodie bags, and they have been a hit! Thanks for the great recipe!! So great to hear! Those biscotti are definitely some of my very favorite!